Courtesy of and for sale at Cigars City HERE. Good cigars bought cheap sent fast. What's not to like? Notes are delivered in a tick hollow wooden vessel at onset, then filed in with a nutty caramel latte replete with a malt addition. Lots of darkly ripe aromatic tobacco. A bit more tension on draw than I find comfy, which led to some coning of burn -- the only ticks against combustion/construction (& slight rounding of press). Altho draw did ease via progressing. Smoked a bit damp, and I keep my sticks dry. Great solid ash-builder. Final act needs some purging to ward off a tick of diesel influence. 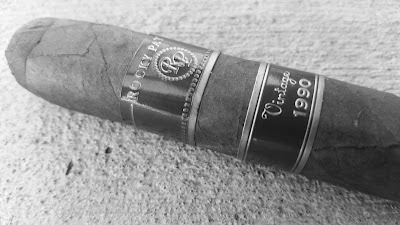 All told a classical cigar, smooth 'nuff, undemanding, and contemplative. Whilst somewhat lacking in complexity, this RP Vintage 1990 is filled to the gills with a robust yet accessible medium profile of exceptional balance.